Continuing with the Writing 201 Poetry Course, we were to use the form of ‘Found Poetry’ – the kind where you take other people’s words and add them all together – the same way one might compose a ransom note with words cut from a magazine. 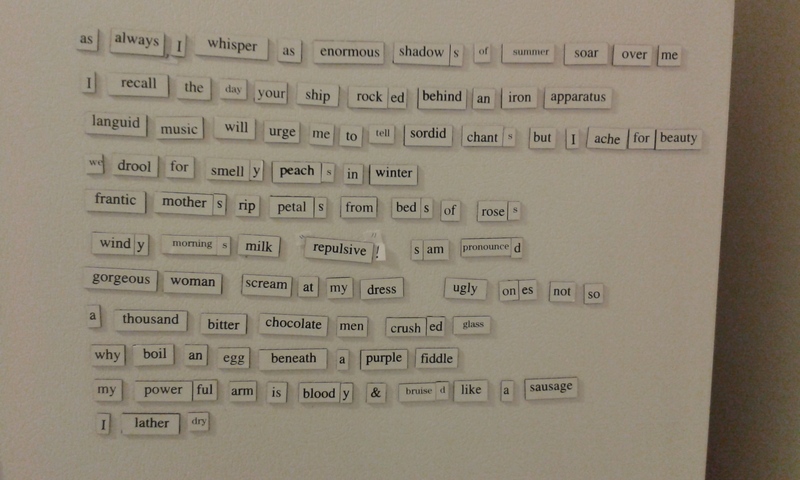 Though the composition currently being formed upon my fridge, would not pass for a cleverly or thoughtfully constructed piece of poetry, it does have an essence of poetry about it. What happens when a brother and sister, and various visitors compose a poem one word at a time. I was going to type it out here – but I’m just not convinced it’s worth it. Apologies to my brother! A couple of nights ago, I combined eggs, tomatoes, carefully caramelised onions, parmesan cheese and home-grown basil – to make a rather delicious frittata to share with a good friend. This friend is a regular reader of this blog, but was yet to experience one of my Marcellan creations – being a friend on the other side of the world, as she is. We enjoyed the sweetness of the frittata and of good conversation. She also dutifully added a word to the poem on the fridge. 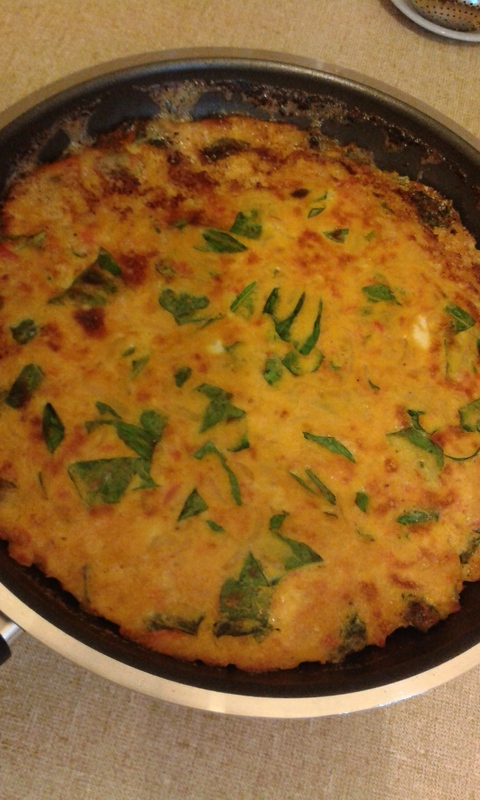 On this Wednesday evening just gone: #105 ‘Frittata with Tomatoes, Onions and Basil’ with Janet at my table. 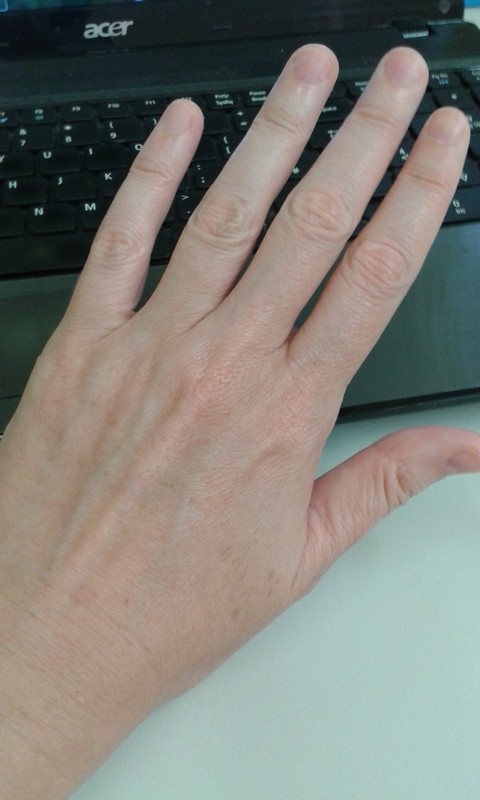 For Day #7 of Writing 201, we are to write a prose poem, around the theme of ‘fingers’, using the device of assonance. I have my Mum’s hands. Future in store for me. In the yard, the kitchen, the office. Keeping bees, on her knees, weeding gardens. I love my Mum’s hands. To start off Week 2 of the Writing 201 course, we were prompted to write a ballad with a big hero/heroine, using the device of ‘epistrophe’ – a cluster of words repeated at the end of each verse. I went with some words I heard last week. Words spoken to a big girl who must have looked like she needed to hear them. She was always a big girl, large from the start. She followed the rules – did her dutiful part. Wherever you are, wherever you go, you’ll always be loved. People love you, you know. In the back row of photos in every school year. They said ‘Big is beautiful!’ to dry up her tears. Strangers asked for directions as they slowed to pass by. She figured, they figured, she’d see far from that high. And if she could help, she’d be helpful, she’d try. Princes were paraded before that big-hearted girl. But unknowing feet trampled the shine off that pearl. They’d all gone before they saw her beauty unfurl. Some say she’s fun. Others say she’s scary. It’s hard to be all things, unless you’re a fairy. Those words, her reality, can seem so contrary. When reality bites and that big girl quakes. Goes to sleep with the fears and rejections that shake. I had enthusiastically signed up for the WordPress Writing 201 course. I had enthusiastically said yes to sharing the costs of installing wifi in the small block of apartments where I am living this year. The wifi wasn’t installed by Monday. I was all set to be poetically inspired and to ‘dazzle’ you with the skills I was acquiring in the course. It’s Wednesday. I’m taking advantage of a coffee break at work, to write this post. It shall consequently not be very inspired. However, I am determined to catch up with the assignments. Day One: a haiku with the theme of ‘water’ and the device of ‘simile’. Day Two: a limerick with the theme of ‘journey’ and the device of alliteration. Black Gold. Shot by Steam. Sweetened. Portioned. Freeze. Then Blend. For her and her guests’ degustation. Last week: #101 ‘Tomato Sauce with Olive Oil and Chopped Vegetables’ with Sonja and Elise at my table. Last night: #102 ‘Prawns with Tomatoes and Chilli Pepper’ and #103 ‘Coffee Ice with Whipped Cream’ with Ray and Cathy at my table. Around twenty years ago, a friend and I formed ‘The Sisters of Perpetual Beauty and Singleness’. We did so tongue-in-cheek, trusting that while remaining perpetually beautiful, we would soon leave the single status behind. My friend announced her engagement to me, in writing, by informing me that our Order now consisted of one Sister. I was delighted for her – though not sure I had the strength to keep the Order going on my own. It seems, 20 years later, that I did have the strength! Around a week ago, a fellow blogging sister of much greater fame than I, nominated me for the ‘The Sisterhood of the World Bloggers Award’. I am now part of a bigger Order 🙂 Do check out her blog Of Opinions. Reading her blog, I often find myself thinking that we’d enjoy a chat over a hot beverage if we ever found ourselves in the same part of the world. 1. What is your favourite part of the day? Though I am not someone who necessarily loves getting out of bed super early, I do love mornings. I feel more alert and love the potential of a new day. Consequently, I also love breakfast – as the meal that corresponds with this time of day. 2. Name a pet peeve and why it irritates you. There are probably many things, but the one which comes to mind, is when people stop in the middle of the footpath to talk, check their phone, consult a map, or consider the overall direction of their life. These are all good things – but things best suited a the side of the footpath. 3. Name one thing the world could do more with and one it could do less of. The world could do with more knowledge of Jesus – who he is, what he came to do and the true life he offers. It could do with less self-centredness. 4. What music are you currently listening to? Who would you recommend it to? I left my CD collection behind as I travelled over to the other side of the world, so these days I am listening to the radio in the car my brother kindly loaned me for the year. I am tending to switch between ‘Smooth FM’ and ‘ABC Radio’. 5. If you were to spend a week on a deserted island, with only five books of your choice to pass the time, which books would you choose? I’m not sure I’d get through five books in just one week – though I guess with the island being deserted there wouldn’t be a whole lot more to do. I would take the book I’m reading at the moment, not because it’s gripping, but because I do like to finish books. So, that would be ‘The Housemaid’s Daughter’ by Barbara Mutch. I would take the book I’m about to start reading – a book on the Psalms – the title of which I cannot remember (and I’m in the local library using their internet, so I can’t hop home to check the title, sorry). I would take my Bible. I would probably take my copy of Marcella Hazan’s ‘Essentials of Classic Italian Cooking’, because even if I didn’t have facilities to cook from it, I’d want to do some planning for cooking adventures once I got off the island and back home. I would also take a book of crosswords. 6. You’re stuck in a time machine. You could either go back ten years or ten years ahead to survive. Which way would you go? I would most definitely want to go forward 10 years. I love the idea of being 50 – so though I’d have skipped my 50th birthday party by a few years, I’d still quite like to be in that season of my life. Going by my parent’s experience, I would also be closer to having a full head of lovely, soft, silvery-white hair and so would be done with the in-between-maintenance of the partially grey-haired woman. 7. They say humans only use 10% of their brains. If you could use an extra 5%, what would you do with it? I would love to be one of those people with the natural ability to remember the little details about people’s lives and therefore ask considerate questions to show that I do actually care about them, even if I can’t remember much about them! 8. Do you have any quirky habits or rituals? Name one, and why you think you do it. It’s so hard to know what’s quirky, as often what makes the habit quirky is that you are unaware that you have that habit. I’d say that the ritual that gets most comment (or raised eyebrows), that I am aware of, is my recording every new recipe I’ve cooked, the date, the people I cooked for, and the place I cooked it, in a little pink notebook. Many of my quirky habits are perhaps not so much ‘quirky’ as a ‘obsessively compulsive’! 9. If you could live as a member of the opposite gender for a day, what activities would you do that you don’t do normally? I imagine I would enjoy focusing on just one thing at a time. 10. What is/was your favourite board game that you would only ever play on cardboard and not on an electronic device? My favourite board game would have to be Scrabble – but I do play that electronically with a friend in the States and some random player somewhere else in the world. As for a board game that I could only imagine playing on cardboard – it would have to be Monopoly. So, there’s a little insight into the further corners of my life! Thanks, to my blogging sister for the nomination! My brother was visiting with me last week in my new place of habitation. He will be visiting, as work dictates, from time to time. It has been great to spend relaxed time together, completing a jigsaw, trying to complete a crossword, reading in companionable silence, and sampling the continuing delights of Marcella’s ‘Essentials of Classic Italian Cooking’. On Friday evening, I reached recipe #100 in my cooking adventure! 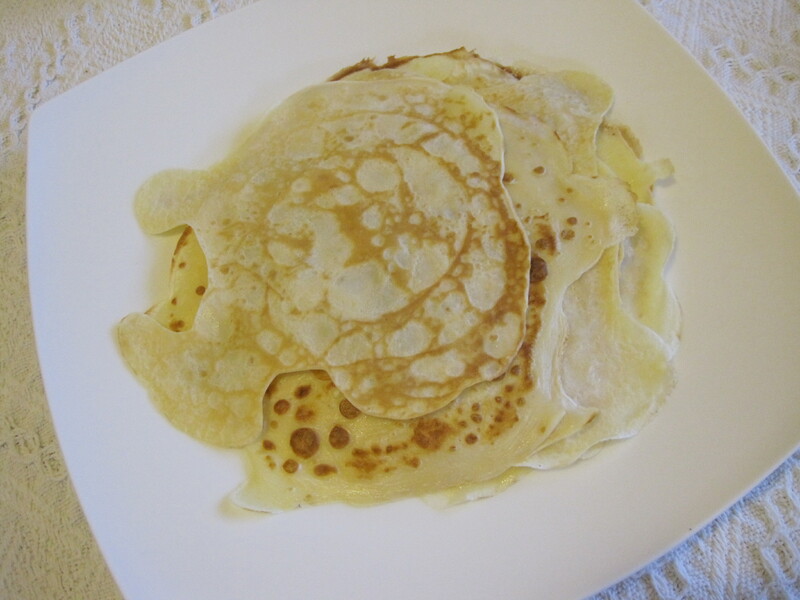 ‘Crespelle’ – The Italian version of ‘crepes’. Marcella has a chapter devoted to these simple, light treats. The chapter only has four recipes in it – the remaining three are savoury dishes where the crespelle are rolled with meat or ricotta fillings and baked. I’m looking forward to making those in the future. For recipe #100, however, I kept it plain – plain topped with sugar, lemon and cinnamon, that is! Just lovely! My brother and I have also started a creative writing project on the side of the fridge. We’re using my magnetic fridge poetry set and have set the challenge of each adding one word, each day to create sentences and, eventually, a story. My brother tends to send the sentences in more positive, upbeat directions – while I tend toward darker, more reflective paths. We are inviting any visitors to likewise add a word during their visit. It’s an interesting discipline, adding one word each day (two with my brother sending his addition by text message when absent from the fridge). We can both, individually, have in our mind where the story will head, only to have that plan foiled (improved?) by the other’s addition. It’s a magnetic, poetic, refrigerated parable of life really. The words are limited. The combinations and narrative directions are seemingly unlimited. The plans we make are temporary and liable to dramatic change. This past weekend, after a couple of weeks of ‘hiding’ in the safety of my family, I attended two gatherings of people who, quite naturally, wanted to know my plans for the future. Yesterday was a gathering of Bible College friends from 20 years ago. Today I made my first visit to my home church, since arriving in Australia this time around. When asked what my plans are, I (and they) had to face the reality that we really only know today’s plans – we don’t even know what tomorrow will bring. It’s comforting to know that my life’s plans are in my loving Lord’s hands. All he asks is that I take it one day at a time – and not be anxious about that. He’s got it covered! The recipes, the fridge magnets, the reality of life’s daily changes, all remind me of this! Friday night: #100 ‘Crespelle’ with my brother at my table.